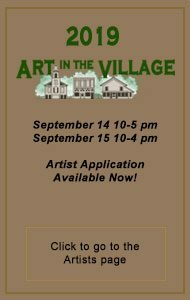 The Silent Auction tent at Art in the Village is made possible by the generosity of our artists and gives shoppers an opportunity to purchase art while supporting the Society. Winning bidders need not be present at the auction’s conclusion; we will contact you to arrange payment and pickup. Donating to the Silent Auction is easy. If you agree to contribute at check-in, we’ll provide a receipt for your records. The Clarkston Community Historical Society is a 501(c)3 charity, so all donations are fully tax-deductible.